Nagging hip pain has brought me here. My running regime interrupted for months as I nurse the overuse injury, cross-training with cycling and swimming. But with little improvement. Seeking answers, I return to the clinic and this time the doctor orders an X-ray and then an MRI. Now we’re getting somewhere, I think. Even if I don’t like the outcome, anything is better than this uncertainty. The MRI machine is very loud, the attendant informs me. I will need the music in my headphones turned up high. “Classical” is my response. My bed travels into the cylinder and the noisy rat-a-tats begin. So does the music. It happens instantly. Suddenly, I am transported back to an elegant living room and a Steinway concert grand piano. I know that music intimately, my fingers can follow it up and down the keyboard. I listen to hear if the top notes “sing” as Mrs. Blair insisted, if the melody comes through and the running passages glide evenly and gracefully underneath. She would approve of the phrasing, I think. The piece that follows is equally familiar. And the next. If I didn’t play them fellow students did. I know them by heart from Mrs. Blair’s “musicales” when we performed for one another frequently over the six years that I studied with her. Mrs. Blair accepted only select musicians. I always wondered how I got in. I remained in awe of my fellow pianists, who mastered sonatas and concertos and played them flawlessly. A constant source of inspiration, I toiled to measure up. But it was really Mrs. Blair that I sought to please. She was of a different era. Always beautifully dressed, in a perfectly appointed second floor apartment in an elegant old house, she carried herself regally despite her advancing age. I never heard her play the piano, her fingers were too gnarled by then. Instinctively I knew she was a master, her knowledge of music unbounded. To me, she was an icon, firm but kind. Loving. I never wanted to let her down. The pinnacle of our years of study was to present a senior recital at the end of high school. 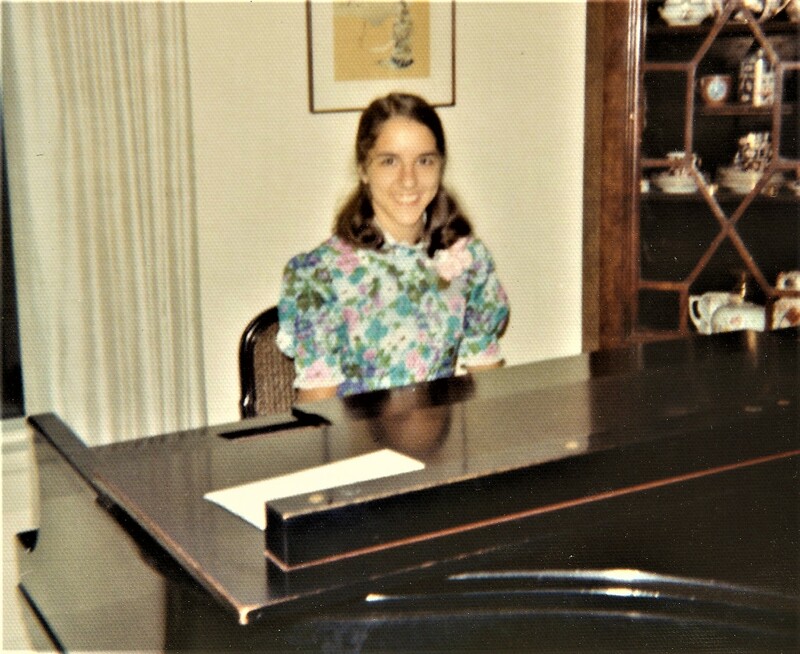 It took place in her living room, with fresh flowers adorning the gleaming length of that Steinway, a corsage and formal gown. Folding chairs formed neat rows between the upholstered furniture, and fancy finger foods awaited in the dining room. I played for an hour in front of my parents and our closest friends. It would be the peak of my musical prowess. For forty minutes I am steeped in these fondest of memories. Not even the machine’s thumping can suppress the music and magic. I am sorry when the tests are complete and I scoot back out in to the real world. I asked for classical music. I got piano masterpieces. It was divine intervention. And music to my ears. 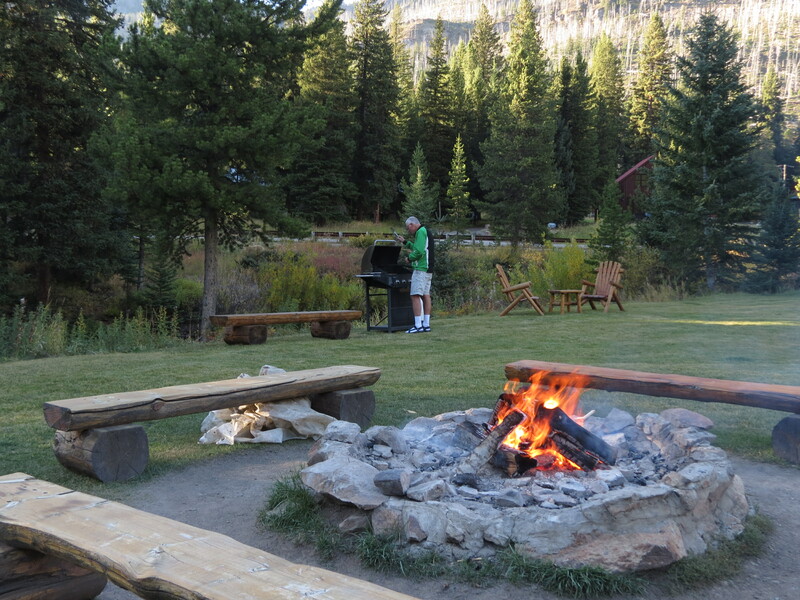 “We have a bonfire every night,” Bob the proprietor of the Grizzly Lodge told us. “People make friends for life there.” I wasn’t sure sure about the “for life part” but I’m not one to miss a good blazing fire. Rich and I were within yards of reaching the entrance to Yellowstone National Park. 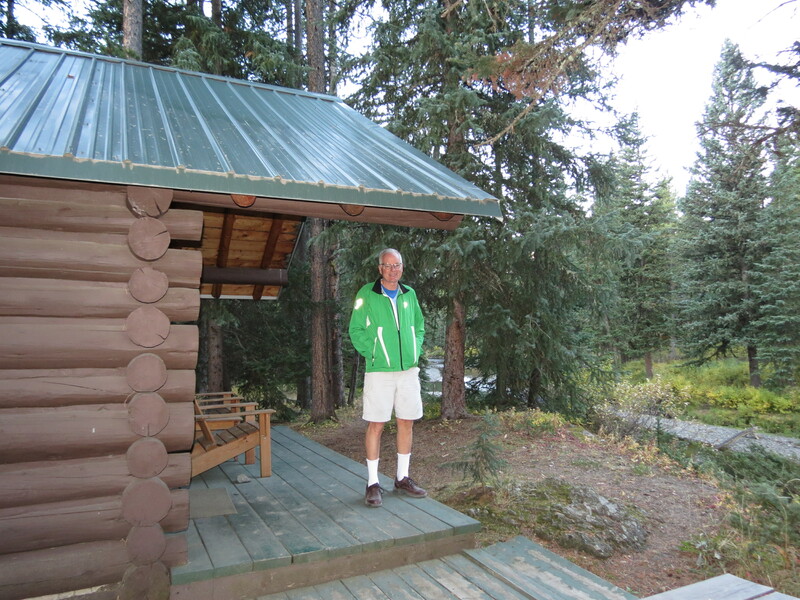 The plan was to find a campsite in the park for the night, but when Rich saw the Vacancy sign on the lodge, he immediately turned into the drive. His deteriorating health dictated better rest than sleeping outdoors on a thin inflatable pad. Late in the season, we scored a tiny cabin right on the riverbank. Rich barbecued out near the fire pit while I prepared the remainder of our camp meal in the cabin. Already the bonfire was ablaze. When Rich crashed and crawled under the colorful patchwork quilt on the soft double bed, I slipped outside. Approaching the fire pit, I could just make out three couples and a young man seated on the quadrangle of logs. I settled next to the couple on the nearest side. Like me, they appeared to be in their 60s. The man was tuning a guitar, clearly a borrowed instrument, muttering about its quality. But when his fingers caressed the strings music unfurled. His picking held the promise of a folk melody as the vibrating notes sang out over the flames. Soon his gravelly voice took up the tune, with an oddly lyrical mix of breathy tones and vibrato. His wife joined in, singing a quiet and alluring harmony, almost a haunting combination. The language was foreign, adding to the mystique. The impromptu performance continued, mostly his guitar and solo voice, always in his native tongue. It was a magical moment. I wanted it to go on forever. Simon Chudnovski and Valentina Kharenko are originally from the Ukraine, and have lived in New York City for 20 years. Both are accomplished musicians, and Simon had been invited to perform in Seattle. Valentina, a pianist, would play as well. They were taking their first long car trip in the US with their son, David. Fulfilling one of David’s dreams, they were visiting as many western national parks as possible in three weeks. Normally they camped and hiked each day, but that night they had allowed themselves a cabin and real beds. David eagerly filled us in on their travels, their music and their lives. The couple on the next log was from the Pennsylvania Dutch area, dressed in their traditional garb. They asked Valentina if she spoke German, and the conversation continued in that language. The Ukrainians took as much interest in each of us as we did in them, as we lingered by the fire. I so wished Rich could be there. I knew he would be as enchanted by the music as I was, as charmed by the experience. I chatted with David as we wandered back to our cabins, and told him as much. He insisted on stopping at his car so he could give me a CD of his father’s music. And he gave me the name of Simon’s channel on YouTube. I invite you to listen to his music. You will have to imagine the heat of the fire, the glow on the faces surrounding the blaze, the crackle of the dry wood. That music floating over the scene. Bob joined us for a spell out there. Said he’d never before experienced a bonfire like that one. When magic happened. Amazon packages arrive by the truckload. Wrapping paper flies off its rolls. The sweet scent of once-a-year cookies wafts through the house. Christmas meals fill every nook of the freezer. Carefully crafted holiday greetings travel far and near. It’s easy to get caught up in the trappings and “must do’s” of the season. I should know – I’m a prime target for succumbing to holiday stress. But the season has a wealth of feel-good experiences as well, and this year I happily overindulged my love for music and theater. All in the name of Christmas. It has become an annual tradition to take our older grandchildren to see a Christmas play. 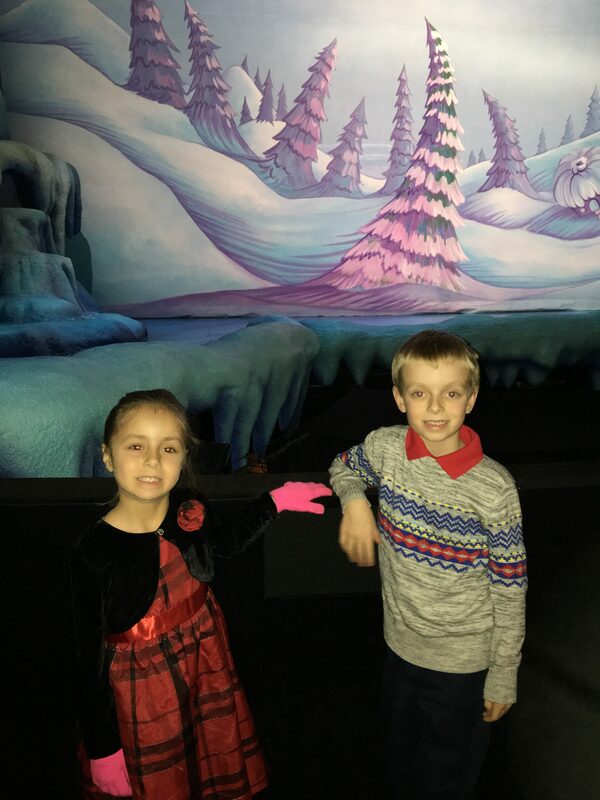 This year we hit the big time, taking Ben and Mya to the Children’s Theater in Minneapolis to see “How the Grinch Stole Christmas.” It was Dr. Seuss to the core, and so very true to the book with a very green Grinch whose mouth sparkled redness. I knew the experience reached the kids when Ben leaned over to me mid-performance, and whispered, “This is really good!” He took the words right out of my mouth. 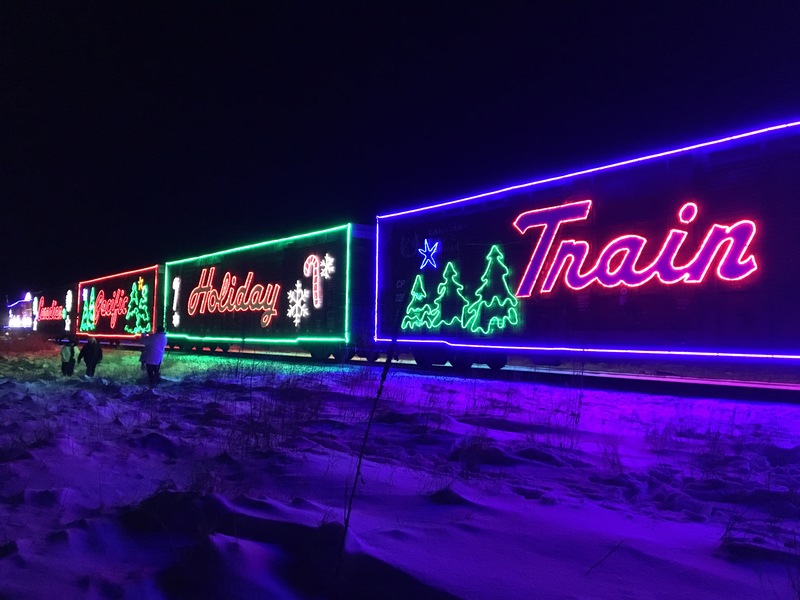 Just two days later, Rich convinced me to go see the Canadian Pacific Holiday Train. 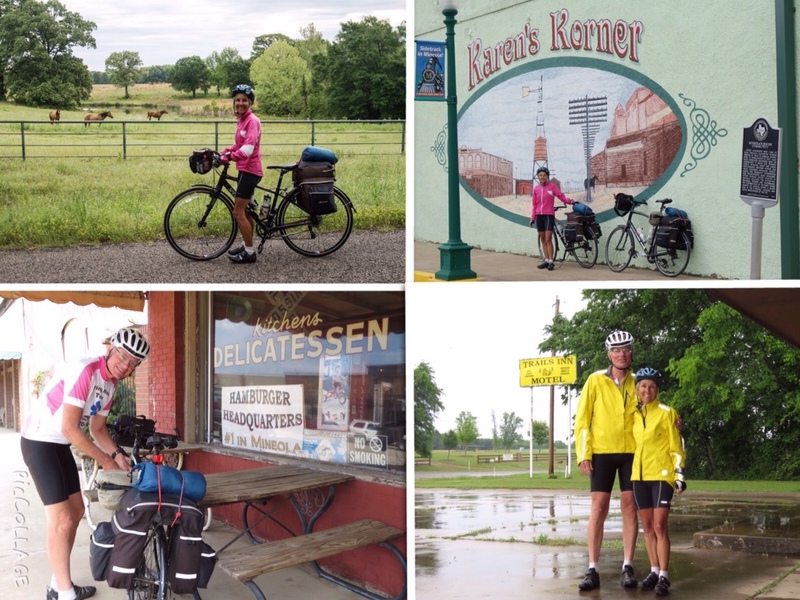 Although it travels through the Twin Cities, he insisted we needed to experience it in a small town. A four hour drive took us to Plummer MN, where indeed we were treated to an energetic community that rallied around the arrival of this brilliantly lit train. At 6:00pm the train slowly approached the crossing, its holiday colors reflecting against the local grain elevator as it passed. Once stopped, a draw-bridge like door came down with fog pouring out and laser lights pulsating. The country music performers where already in place and performing by the time it was fully open. Pressing against the stage, the crowd bounced to the music, performers hand-bumped the kids up front, and we all sang “Santa Claus is Coming to Town” with the musicians. Thirty minutes passed quickly, then the train resumed its journey – on to the next town. 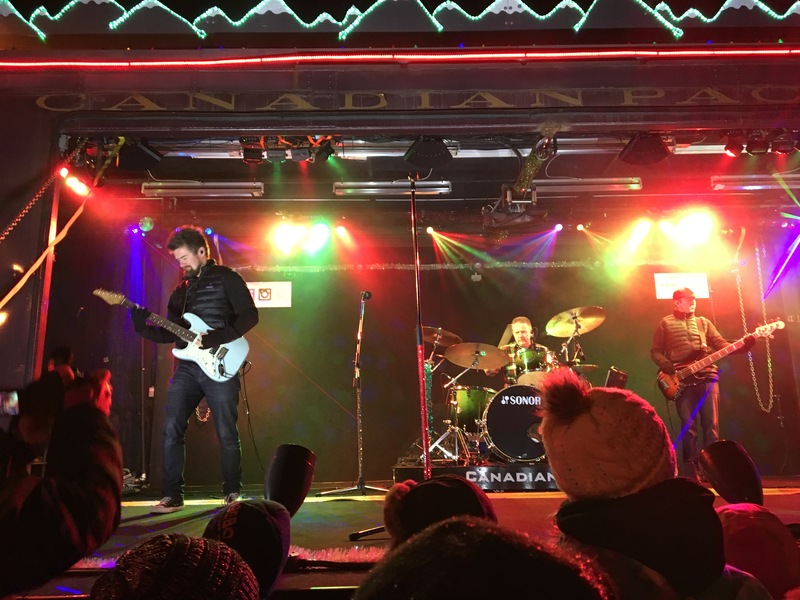 Its whole purpose is to support local food shelves, and indeed the evening’s take from locals as well as a generous donation from CP covers half their needs for the whole year. My heart glowed as brightly as my face in the glimmer of the retreating train. Returning to Duluth the following day, we turned to home town entertainment. That very night we had tickets to “A Christmas Carol” at the Duluth Playhouse. No matter how many times I see that show, it always delights and conjures up the goodwill of the season. Topped off with wine and Christmas cookies with friends in the light of their decorated tree, it was an evening hard to beat. Quite a blitz for one week. An abundance of holiday cheer, certain to propel me through the remainder of the Christmas season. 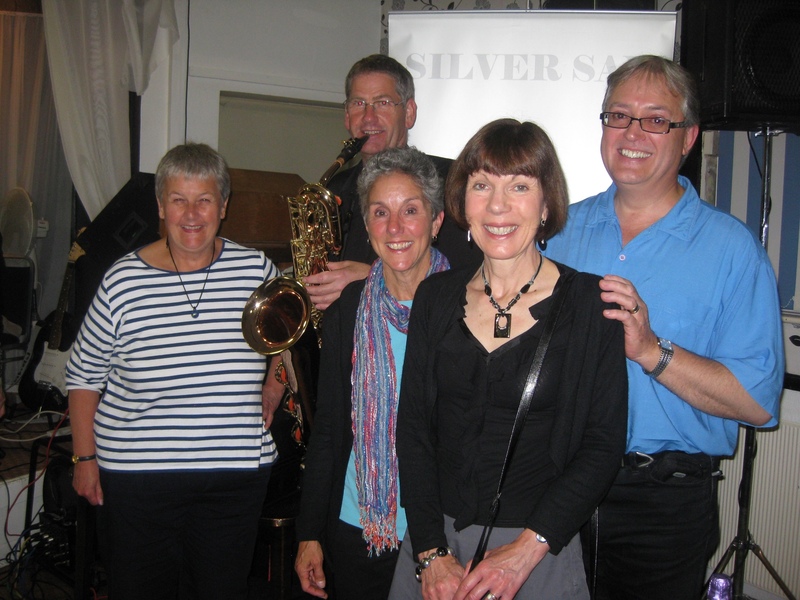 They call themselves the Silver Sax. 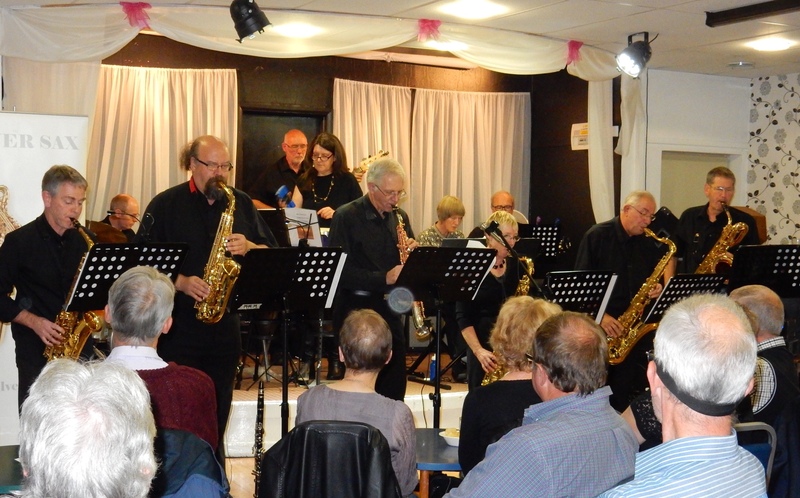 Starting out as a quartet ten years ago, they have blossomed into a robust band of eleven, over half of which are saxophones which range from soprano to baritone. 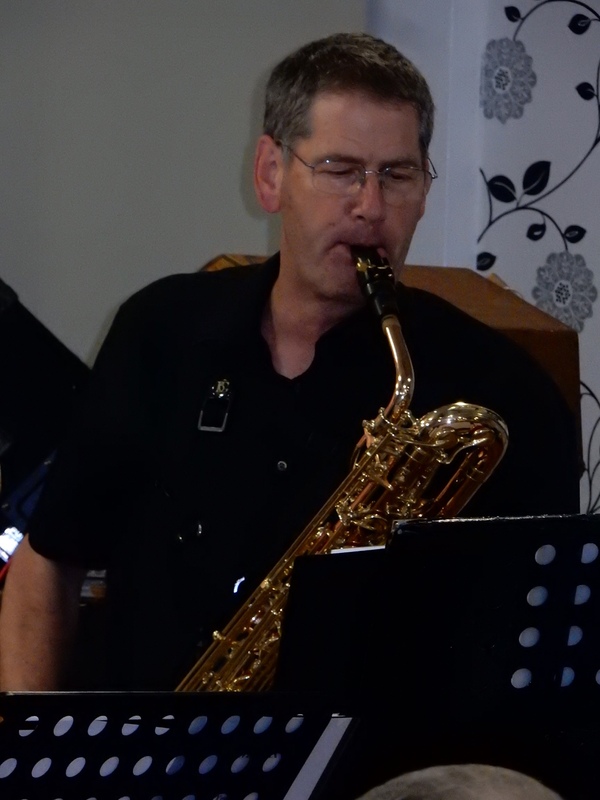 Jo's husband Peter is one of the original members. It was he who explained to me the significance of the name, which refers to the members' hair color. By happenstance, they were to play a charity event while I was there. It was the perfect event for our mini-reunion. Mary and Shaun arrived toting a bottle of bubbly to celebrate the occasion. 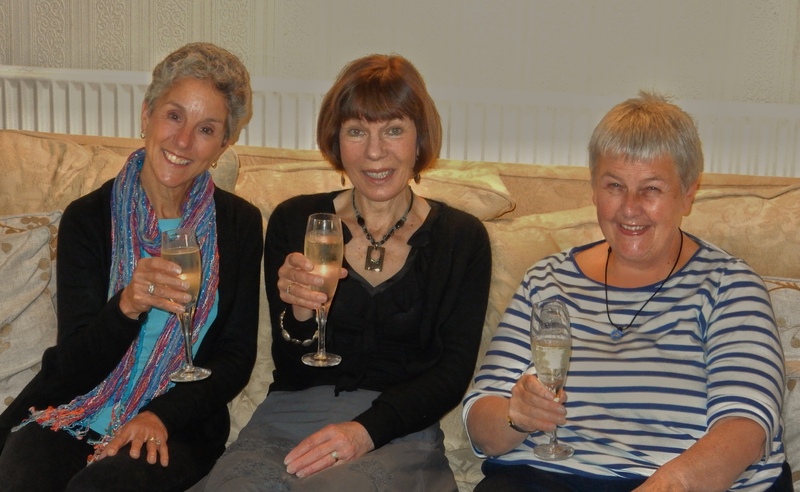 Mary, Jo and I were reunited one more time, now 40 years since we all first met at Durham University. We covered as much ground as we could over drinks and dinner, dragging up old memories and recounting recent updates. But the main event was still to come. Although we knew Peter played in a band, apart from Jo the rest of us had never heard him play. In his quiet way, Peter made light of his musical endeavors, but we all suspected he underplayed his and the group's prowess. We were eager to hear it for ourselves. It was an eclectic old building that housed the bar where the event was hosted in the large back room. Arriving early in time for band set-up we carefully selected a table mid-way back, knowing the band would produce a full sound. Procuring our beverages from the bar at the back, we settled in to watch the room fill. All manner of dress and age were represented, although most like us sported the same hair color as the band. With the first note we knew we were in for a good night. The first half was comprised of big band music, and their renditions of Count Basie and Glenn Miller were a solid credit to the original jazz and swing music. What they lacked in trumpets and trombones, they made up for in saxophones, and very effectively so. It was good foot tapping music, and each piece was better than the last. The music was interspersed with tidbits about the music and the band by their leader, who proved to be enlightening and articulate as well as a talented musician. After intermission, the second set changed gears entirely. Tackling the likes of the Beatles, Abba and the Beach Boys, the band rocked the house with their lively tunes. Foot tapping gave way to bodies jiving to the music. It couldn't be helped, it was that irresistible. Chicago followed and kept us so entertained that we begged for an encore when the time came. And the Silver Sax graciously (and readily) accommodated with a medley from Earth, Wind and Fire. We all agreed that Peter had kept his musical skills and fellow musicians a good secret for far too long. But now that we knew better, we'd be back for more performances. To me sounds like a good excuse to return to England. I'm sure I could be talked into seeing my Durham friends again for another saxy reunion. You just can't predict when those priceless moments will arrive. But when they do, it is oh so sweet. Tonight was one of those occasions. The day was a trying one. Despite the expectations of “spring showers” we managed to stay dry on the first 15 days of this trip. And even today, we were sure we'd dodge the storms. We cycled through some beautiful farms and horse country. We enjoyed the mural in Mineaola, which reminded us of our daughter, Karen. And we lingered at the Kitchen's Restaurant, with their decadent cinnamon rolls, to let the rains pass. We kept our eyes on the weather maps. But eventually it all caught up with us. And yet, we still outwitted the downpour by sheltering under an unused carport. At the end of the day, all we wanted was to escape our cheap motel in Winnsboro and find a good meal. The nearest restaurant was Richie's Grill and Cafe. 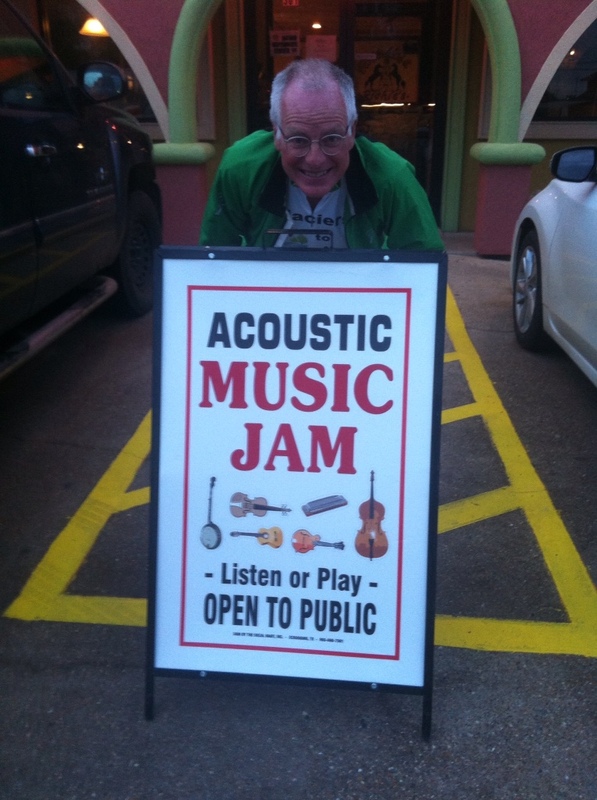 As we wandered in to check the menu, we noticed the sandwich board outside promoting a live jam session that evening. Since the offerings looked reasonable, we gave it a try. Seated near the music, we couldn't help but hear the tunes and inquired about it. They are locals, we were told, who gather every Tuesday evening to play their accoustic guitars and take turns leading the songs. From what we could hear, it was mighty good. So once we finished our meal we wandered into the next room to have a listen. We were warmly welcomed by the groupies already gathered, and were soon seated and mesmerized by the ten or more guitar players plus additional singers and musicians who made up the group. We couldn't help but be a bit obvious in our synthetic wear among the denim and cowboy hat population there, and we easily struck up conversations with those around us. Soon musicians came over to welcome us as well. They even managed to get us into the act! The group rotated the lead among themselves as well as mentoring less experienced players, which was nice to see. And every so often they played something familiar enough that even we could sing along. 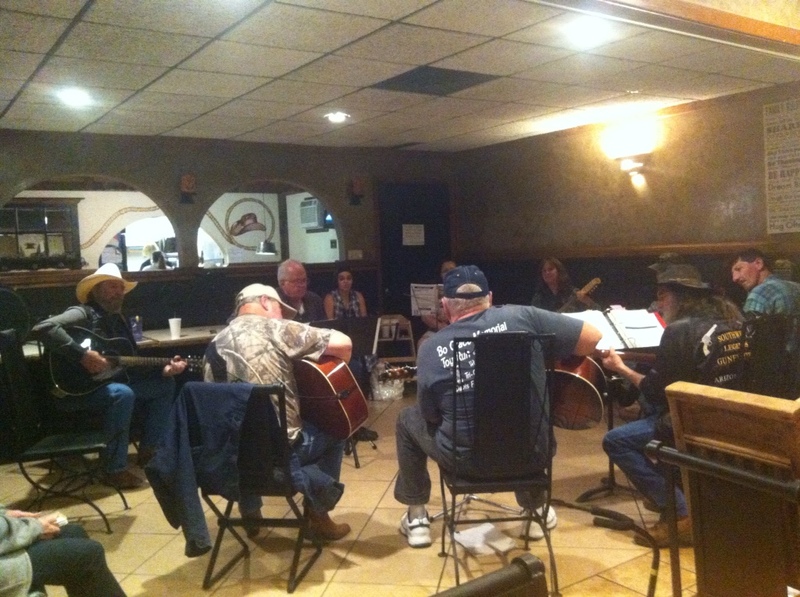 It was wonderful to hear that their numbers swelled to 18 guitars on the first Fridays when they played at the local nursing home. Sitting there listening, appreciating and just enjoying I couldn't help but think what a fun and unique experience it was. Sure, It could have happened if we were traveling by car. But chances are wwe wouldn't have been open to it the same way. This is why we bike tour. You can't beat offbeat, unplanned evenings like this. We’d seen the signs all week long. Music in the Park on Sunday evening. It was an alluring invitation – right in the development, a warm summery evening, and only a bike ride away. With Dad feeling tired and interested in going to bed early, we decided to treat ourselves to a night out. Approaching the park, we were amazed to see the line-up of cars. And even more surprised by the golf cart that passed us, with a glass of wine in the hand of the passenger! Realizing that the event was in a private venue, it suddenly dawned on us that anything was fair game. Indeed, all around us were gourmet picnic spreads, bottles of wine, and even tables with balloons. We arrived with two cans of pop and the remnants of a bag of pretzels in hand. Without lawn chairs, we settled ourselves on an open patch of grass and flipped open our pop. Clearly we were a pitiable site, as we soon had offers of a blanket, food and wine from the friendly people around us. Being good Minnesotans, we politely declined several times. But we could hold out only so long, and ultimately succumbed to glasses of very nice red wine. The music turned out to be lively and fun. While enjoying the doo wop rock, blues and classic country music of the 50s and early 60s, the concert was suddenly interrupted by sirens. The Blues Brothers arrived via an old police car with a classic Bellaire sheriff’s vehicle in pursuit! They joined the musicians and doubled the entertainment. Between the music and the warm evening, it was a great time. We decided it was best to leave before dark, which just happened to be when the Blues Brothers made their exit. Naturally, they clamored for a picture with me, so I graciously obliged! Christmas is a season rich in musical traditions. Coming from a family steeped in music, I have fond memories of Christmas caroling out in the cold with family and neighborhood friends. I sang in countless Christmas concerts, and mustered family members to play musical instruments in church for Christmas services. It was a joy to see the tradition continue when our children were old enough to sing in Christmas concerts of their own. And when they went on to sing in college choirs we were treated to some of the finest musical tributes of the season. With college graduations behind us, we decided the trips to distant campuses were no longer necessary. Instead, we have visited local colleges to sample their Christmas music. It’s amazing the talent we have in our midst. This year, however, I was drawn back to the past. 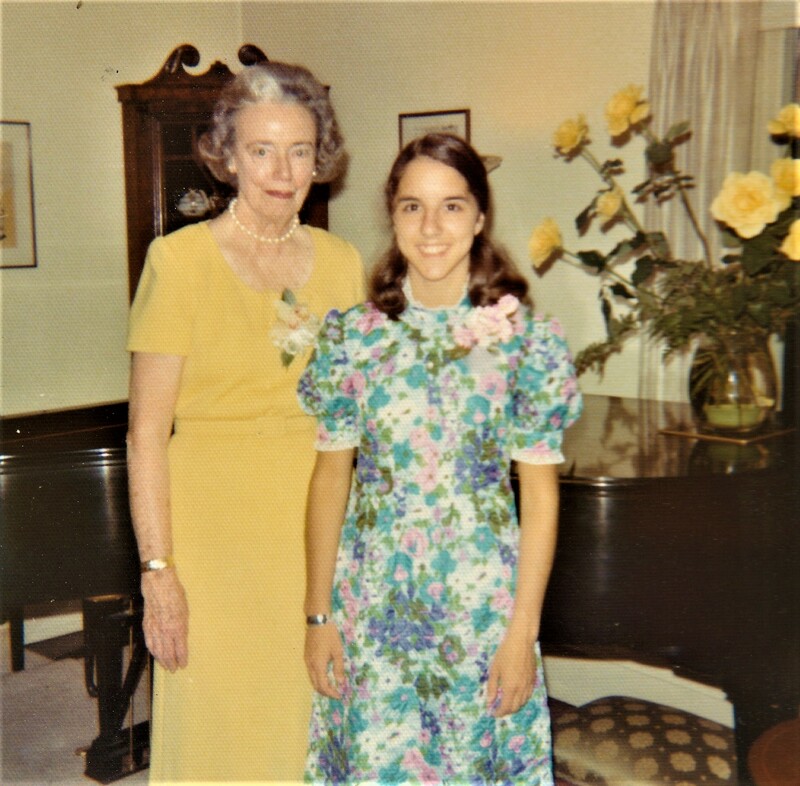 In middle school and high school, our daughter Karen spent five magical years singing under the direction of Julia Fahey in the Partners in Praise Girls’ Choir. It was an experience that would shape her life, both musically and personally. 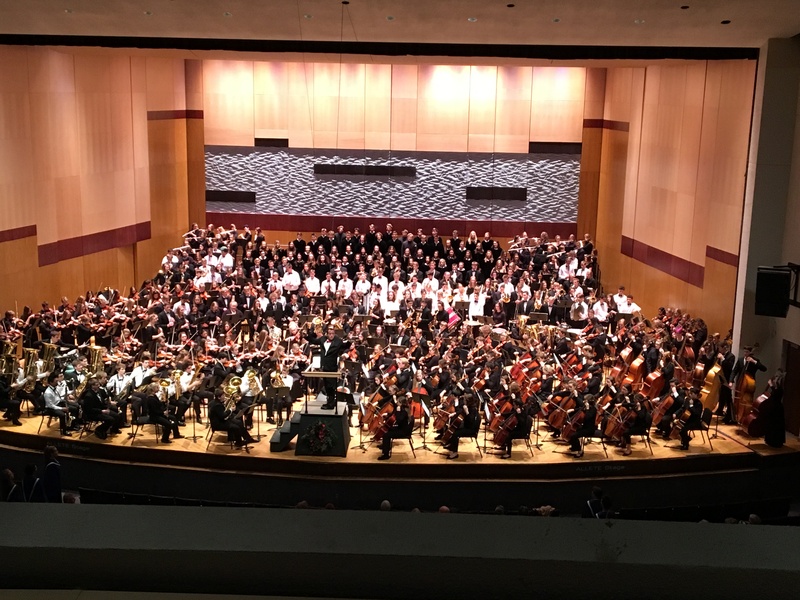 The music that the choir produced, the discipline that it required, and the mutual respect that each member had for each other were of the highest standard. They traveled internationally, performed spontaneously in public places and sang in prestigious venues, but more than that, they won the hearts of all who heard them sing. As Karen put it, Julia taught them so much more than just music. So when I realized that I would be in the Twin Cities close to the time of their annual Holiday Benefit Concert, it was no decision at all to extend my stay long enough to attend. As always, it was an evening that filled my heart as well as my holiday music quota. The girls looked so young and I didn’t recognize a single one, but it was the same choir. They still had the that special sound, the spirit, and they owned the music. When alumni were invited up to sing, I couldn’t stop the tears from rolling down my face as Karen took her place among the other singers. They all still sang like angels, just with richer more mature voices. I couldn’t get enough of the music that night. This was one holiday music tradition that was well worth going back to relive. I just may have to do it again next year.